各活動の詳細（ブログ）はこちら / Our blog is here. ☆25th, February - 11th, March, 2012. Our photo exhibition, "Fuyu no iro - the 2nd" (The colors of winter) was held at avocafe (avocado restaurant in Jimbocho). ☆1st - 10th, March, 2012. Our photo exhibition, "Monochrome no kiseki" (The trajectory of monochrome) was held at Nikon Photo Square (in Shinjuku). ☆11th - 24th, February, 2012. Our photo exhibition, "Fuyu no iro" (The colors of winter) was held at avocafe (avocado restaurant in Jimbocho). ☆16th - 20th December, 2011. One of our members, aya, joined the exhibition hold by "0ptic Nerve". For details, please click HERE (only in Japanese). ☆12th - 20th December, 2011. One of our members, myk joined the photo exhibition named "Hana Musume (flower girls)" at Nikon Photo Square in Shinjuku. ☆15th - 27th November, 2011. Two of our members, ashmoca and myk joined the photo exhibition named "Hitori-Itten" (in Nadar). ☆22nd - 24th October, 2011. One of our members, ashmoca, provided his photo for a charity event.The host will donate their full proceeds to Tohoku area where a big earthquake hit in 11th March, 2011. We plan to show the works of this day in our group exhibition in February, 2011. ☆9th September, 2011. One of our members, ashomoca, provided a photo for iPhone App "iSHOWCASE vol.2. You can download the app from HERE for free. ☆2nd - 4th September, 2011. 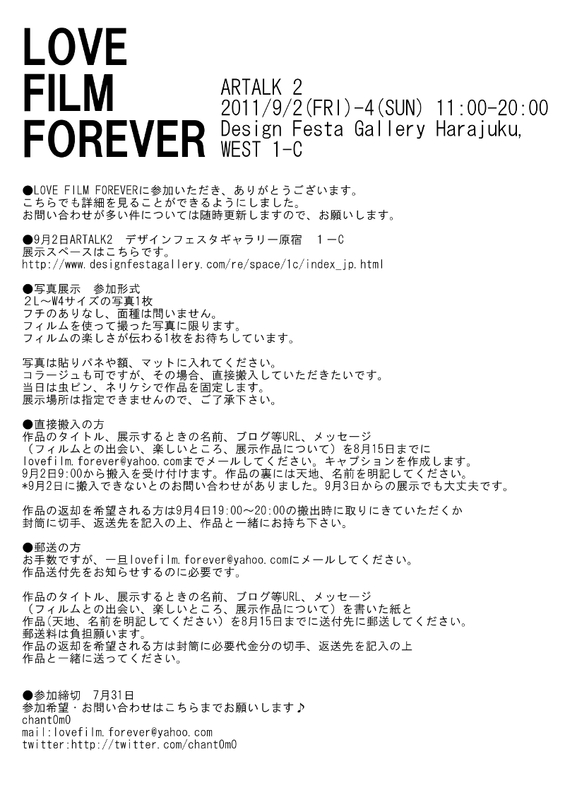 One of our members, kAz_55, joined the photo exhibition "LOVE FILM FOREVER". ☆23th August - 4th September, 2011. One of our members, aya, joined the exhibition hold by "0ptic Nerve". Works of the day are HERE. ☆20th June, 2011. Started this group as "CAMHOLIC"! A web designer and a photographer, Tatsuya SUZUKI provided us the logo of CAMHOLIC. We thank you very much for your kindness, Tatsuya! His website is HERE (in English). (C) 2011 CAMHOLIC All rights reserved.